We are excited to partner with Ohr Torah Stone and the Israeli Ministry of Diaspora Affairs to bring Amiel BaKehila to the Greater Hartford region! Over the course of the next year, 5779/2018-2019, we look forward to welcoming 6 delegations exploring issues of culture, politics and Judaism. Amiel BaKehila is an exciting initiative that brings excellent Israel educators, artists, titans of industry and Israeli engagers to communities across the globe. It is spearheaded globally by the Ohr Torah Stone Network and the Israeli Ministry of Diaspora Affairs and run locally by the Young Israel of West Hartford made possible by support from the Jewish Federation of Greater Hartford and the Jewish Community Foundation and in partnership with Jewish organizations and synagogues across the Greater Hartford area. More information coming soon. To sign up for the emails or to bring ABK to your Jewish organization or synagogue, contact us at ABK@youngisraelwh.org. Scroll Down To See List Of Upcoming Events! 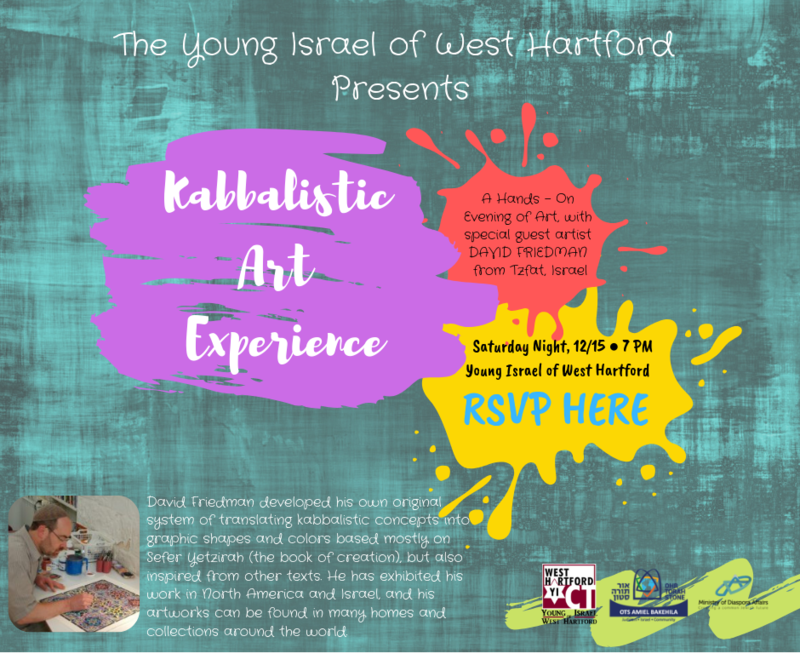 On the heels of an exhilarating Shavuot, I am thrilled to share with you a new program we will be incubating at the Young Israel for the Greater Hartford region next year: OTS Amiel BaKehila (ABK). Under the auspices of the Israeli Ministry of Diaspora Affairs and the Ohr Torah Stone network, ABK is partnering with communities around the globe to bring out excellent Israeli educators, artists, titans of industry and Israeli Engagers for a number of 2-3 day visits to engage, inspire and empower Jewish communities and create a living bridge between Israel and the Diaspora. I am happy to share that we in the Greater Hartford community will be one of their pioneering Kehilah communities. Young Israel, in partnership with the Jewish Federation, will be serving as the organizing agency and local contact for this partnership. It is our hope and goal to coordinate opportunities and programs for and with the entire large diverse Hartford Jewish community to benefit from this program! In that vein, we are excited to share that the first group of Israeli ambassadors who will be joining us already next week! (The rest of the visits will be scheduled for the 2018-19 year). We have the privilege of welcoming Israeli Tour Guide Eitan Morrell, musician Yitchok Meir Malek and Rabbi Reuven Spolter. Already over their short pilot visit, we have events lined up at the Jewish Federation, Hebrew Academy, Hebrew Center, Hebrew High School of New England, Young Israel and Agudas Achim. This is a brand new program for Israel and OTS and one I believe that has the wonderful potential to bring valuable, accessible and financially feasible content and Israeli connectedness to our community. Learn about the fascinating connections between Jerusalem and America as we “meet” the first American Consul in Jerusalem and hear of his conversion to Judaism. You’ll discover connections between Jerusalem and the battle of Bunker Hill and hear about Americans who played a role in the defense of Jerusalem and the establishment of Israel in 1948.